There are three broad groups of rice: short-grain, medium-grain, and long-grain. Short-grain rice is the most commonly consumed in Japan and is mostly Japonica rice. Medium-grain is rice that is medium in length such as Calrose rice. Long-grain rice is a long and thin like rice eaten in Thailand, and known as Indica rice. In general, short-grain rice is best suited for sushi. It is soft and sticky* and keeps its shape when cooked. Further it has more taste the more you chew, and also has a sweetness to it. Japan’s rice crop comes from rice paddies. Medium-grain rice such as Calrose rice is mainly grown in upland and dry areas in places like America and Australia. Through selective breeding, medium-grain rice has become glossy when cooked and can now be used for sushi. On the other hand, long-grain rice like Indica is not sticky enough and cannot be used for sushi rice. It is suitable to be mixed with sauces or in dishes where flavor is added like fried rice. *There are two types of starch in rice: Amylose and Amylopectin. Amylopectin is what makes rice sticky when it’s been cooked. The Amylopectin content of Japonica rice is high at approximately 80%. On the other hand, Indica rice is low at 70%, so it is a less sticky. Currently there are about 600 varieties of rice registered domestically in Japan, and about 260 varieties are produced as a staple food. If you consider just crops, the top 10 varieties occupy almost 80% of the total crop area. Of those, Koshihikari takes up an impressive 30%. The next is Hitomebore at 9.4%. After that is Hinohikari with 8.9%. Akitakomachi is 7.0%. Nanatsuboshi is at 3.5% and the top 5 have not changed for the past few years. These varieties are the types of rice that consumers to eat at home. In general, Koshihikari is sticky with a stronger density, it is plump with a good luster when cooked. This quality and its taste have earned it the top reputation among sushi chefs. 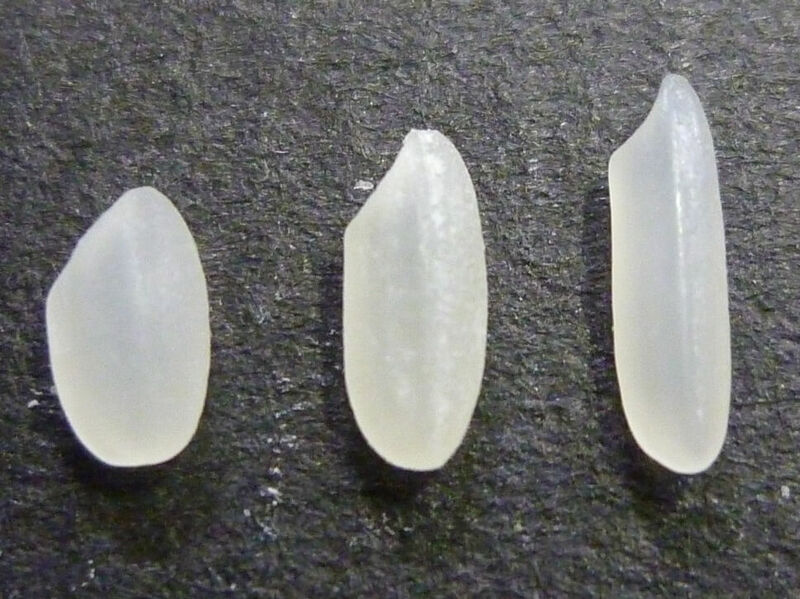 Sasanishiki has a soft texture with a shine on each individual grain. When cooked, it has a glossy and wet finish. The stickiness, texture and the sweetness is suitable for sushi. Hatsushimo has a slightly larger grain so it is a bit chewier and it can be stored for relatively long periods of time after harvesting without losing its flavor. Koshikari boasts the same features, but it can be firmer when produced in places with a large gap between cold and warm seasons, and the product from the same location can be different in flavor, smell and texture depending on the field. If you think about it, that is exactly what you would expect. Further, rice is said to be the most delicious when it is fresh (for about 3 months after it has been harvested in September). But in some cases instead of fresh rice, rice that has been stored for over a year after harvesting is used intentionally. This is usually called “old rice,” but this doesn’t mean it has reduced quality. It will have been stored in a temperature and humidity-controlled warehouse, waiting until it is optimum to be used as sushi rice. Still other sushi restaurants may favor a blend of multiple varieties or mix old and new rice. What is a rice taste ranking? The Japan Grain Inspection Association creates a rating based on taste tests conducted every year for the purpose of improving and popularizing Japanese rice. The rating is based on 6 aspects of cooked rice: exterior appearance, smell, taste, stickiness, hardness, and overall evaluation. A blend of rice including Koshihikari from multiple locations that year is used as a standard grain for comparison. The rice are given grades according to the overall evaluation. Superior rice is A+, good rice is A, rice that meets the quality of the standard grain is A’. Rice that is slightly worse than standard is B, and lower than that is B’. However, these are the tastes of the judges and taste is subjective, so what the judges believe is delicious and what is not is really just opinion. What types of rice is preferred by sushi chefs? In the end, the variety of rice is important, but assuming that quality also depends on its origin and producer, we asked what rice variety one well-known sushi restaurant used. Their invaluable responses were Hitomebore (A+), Tsuyahime (A+), Akitakomachi (A+), Koshihikari (A+), and Sasanishiki (A’). Just for your reference.